If you’re a fan of baked chicken recipes or easy chicken recipes, then you’re going to love this pesto chicken. Topped with fresh pesto sauce, tomatoes, and a mix of cheeses, this pesto chicken recipe is one dish that you won’t be able to get enough of this summer. Finding healthy chicken recipes can get tricky because most searches will lead you to grilled chicken breast options. While grilled chicken is delicious, discovering new ways to spruce it up can make all the difference between healthy food becoming boring or exciting. This pesto chicken recipe uses fresh, homemade pesto sauce made in a food processor. If you’ve never made basil pesto sauce, be prepared to make one of the easiest foods you’ve ever made. The combination of basil, olive oil, garlic, and parmesan is irresistible. The pesto sauce simply gets spread on top of the chicken breast, then topped with some fresh tomato slices and a mix of mozzarella cheese and parmesan cheese. The mozzarella provides that stretchy quality we know and love with cheese, while the parmesan adds some great flavor. When you’re looking for simple chicken recipes, dishes like this pesto chicken are truly a Godsend. There’s no fuss with this recipe and minimal effort required. 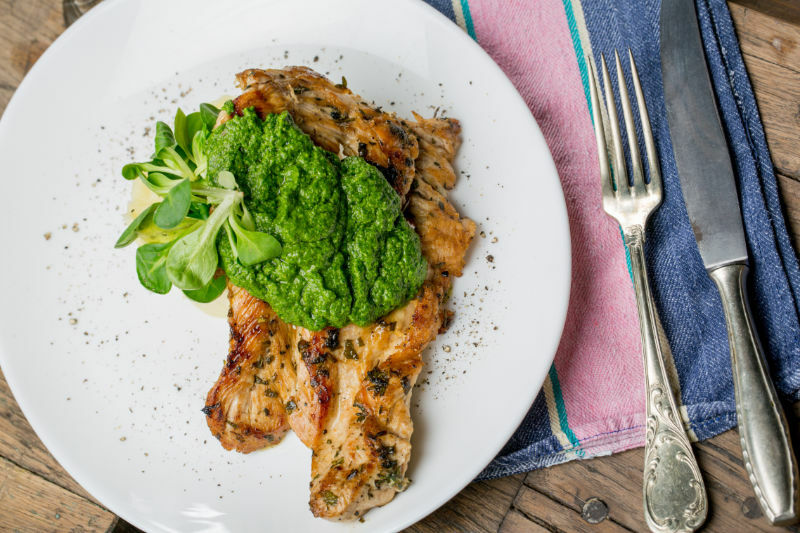 In fact, we think this pesto chicken recipe is one of the best chicken recipes around! Preheat the oven to 400°F. Line a baking sheet with a silicone mat or a sheet of parchment paper. Cut each chicken breast in half, making a horizontal cut so that you end up with 4 thinner chicken breasts or cutlets. Season each piece with a pinch of salt and pepper. Transfer the chicken to the prepared baking sheet. Spread a teaspoon of pesto sauce over each piece of chicken. Bake the chicken for 15 minutes or until the chicken is no longer pink in the center. Temporarily remove the chicken from the oven and set 2 to 3 slices of tomatoes on top of each chicken. Add some mozzarella and parmesan to the top of each, then bake for another 3 to 5 minutes until the cheese has melted.